Karaka Tree Motel is lucky to have the only taupo accommodation with mineral spa pools in every room.One thing to note is that our accommodation in Taupo is often booked out well in advance so you should be sure to book early for peak holiday times, for instance over the Christmas holidays and long weekends. Private Mineral Spa Pools with Every Room! 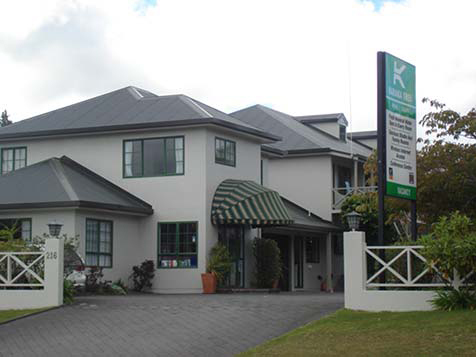 Karaka Tree offers fantastic value for money, excellent customer service and spacious, comfortable rooms. The property is set in attractive grounds directly across the road from Lake Taupo with free car parking and is the only motel in Taupo with geothermal mineral freshwater hot pools in EVERY room. The property features 24 spacious Spa Studios located upstairs and One Bedroom Spa Suites located on the ground floor. Every room is extremely spacious and the One Bedroom Spa Suite offers a separate bedroom and lounge area, as well as a private courtyard area with a fabulous geothermal mineral water hot spa pool and attractive outdoor table and chairs. The Spa Studio has a separate room with a geothermal mineral hot spa pool. All rooms have an en-suite with a vanity and walk-in shower cubicle. Every room has air conditioning, balcony, remote controlled colour TVs, refrigerators, tea & coffee making facilities, en-suites (Premium Spa studios with large spa baths), Wireless Broadband internet access is available in every room, electric blankets, iron and ironing boards, hairdryers, clock radios, mini-bars and plunger coffee. Microwaves, cots and highchairs are all available on request at no extra charge. Or to book now chose your dates below and click the book now button.